Tuning your 7.3 Powerstroke will unlock the treasure trove of power and precision that’s hidden beneath your vehicle’s factory settings. In fact, the right tuner can increase your vehicle’s horsepower, torque, speed, and more. The best part is, these handy devices are easy-to-install and take just a few minutes to load before they completely reinvigorate your vehicle’s engine. Read along to learn more about tuning your 7.3 Powerstroke engine. Then, check out our reviews for five astonishing 7.3 Powerstroke tuners. The Flashpaq tuner is a proven performance booster that can unlock the power hidden deep beneath your Ford’s stock settings. It’s compatible with a wide range of America’s favorite trucks, including F-250s to G-550s from 1999 to 2003. It’s also compatible with select Powerstrokes. With that said, you can easily check with the manufacturer to see if it is a good fit for your vehicle’s make and model. 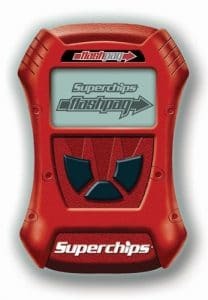 If you’re sick of paying $100 just to have your engine codes cleared, then the Superchip is going to blow your socks off. This easy-to-install device reads and clears codes with ease. What’s more, it enables you to recalibrate your speedometer and odometer to accommodate a change in tire size or gear ratio. It won’t take long for you to feel the improvements brought on by the Superchip tuner. This attractive red device plugs directly into your vehicle OBD II port, enabling you to unlock hidden torque, horsepower, acceleration, and more. The Superchip tuner boasts plenty of power gains and driving improvements, just be sure to anticipate a bit of black smoke after you get it up and running. Not many power-boosting vehicle elements can fit in the palm of your hand. However, the Flashpaq does this just fine. This little red device can do everything, including boost your engine’s efficiency and tune your transmission shifts. What’s more, the device’s 2.8-inch screen and easy-to-navigate graphic interface provide ride-altering updates a breeze. Not to mention, the Superchip 2-year powertrain warranty is the added assurance most customers are looking for in an aftermarket tuner. The Edge Products 15001 Evolution is a dash-mounted engine tuner that does wonders for Ford Powerstroke 7.3-liter engines. With three unique power levels, drivers can easily tweak their vehicle’s settings to meet their personal needs. What’s more, the Evolution reads and clears engine trouble codes, enabling users to skip a trip to their local mechanic. 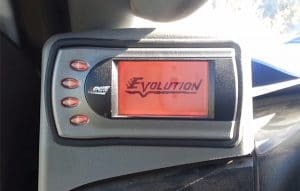 While the Evolution is designed to be permanently mounted on the dash of your vehicle, you can also use its USB cable to connect it to the internet and download important updates and engine calibration files. You can also purchase an accessory expansion system to add performance-boosting elements, including a back-up camera and/or pyrometer. Since the Evolution keeps track of performance data, it can even alert you when your vehicle hits its driving goals. When you first look at the Evolution’s slender 5-inch color screen, it’s hard to believe it’s capable of overhauling your entire vehicle. Nevertheless, with one press of a button, you can increase your vehicle’s fuel economy, driveability, shift points, torque, and more. In fact, the Evolution can even adjust your vehicle’s speed and rev limiters. While the Evolution is rather pricey, it offers proven results. As a matter of fact, the manufacturer claims that it can increase a vehicle’s horsepower by 30 units. What’s more, they claim that it can increase a Powerstroke’s torque by a whopping 50-feet. Since all this translates to faster movements and more rapid responses, it’s easy to see why the Evolution is so popular with road warriors. Looking for a trimmed-down tuner that will still give you the performance boost you’ve been dreaming of? 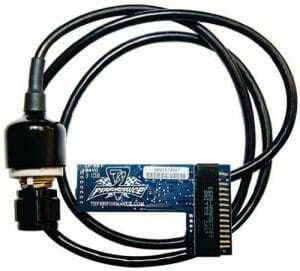 The TS Performance tuner consists of an easy-to-install performance chip. Designed to increase a diesel vehicle’s horsepower and fuel economy, this switchable chip is virtually dummy-proof. What’s more, after you install it, it only takes a few minutes before its tunes kick in. While the Ts Performance chip doesn’t have over-the-top graphics or a touch screen, it does offer six preinstalled power-booting tunes. These include Stock, High Idle, 50hp, 75hp, 100hp, 140+ Extreme. Each of the six settings is tailored to boost specific 7.3 Powerstroke performance factors. 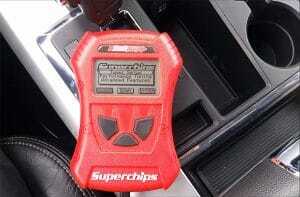 The TS Performance chip is compatible with 1995 to 2003 Ford 7.3 Powerstrokes. What’s more, it is engineered to connect directly to a vehicle’s computer system. As such, drivers can easily access and adjust the chip from within their cab. Whether you’re looking to improve your Powerstroke’s towing capabilities or simply want to increase the power of your aging truck, the TS Performance chip offers a wealth of potential. 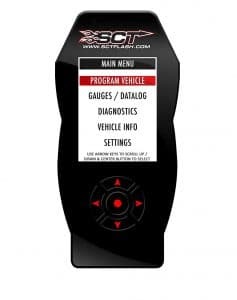 The SCT Performance Power Flash Device features three custom tunes that are designed to increase your vehicle’s horsepower, torque, and fuel efficiency. On top of that, it logs vehicle performance data while monitoring it in real time. 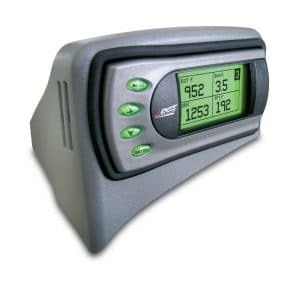 Whether you are looking to keep track of your fuel usage or exhaust output, the SCT Performance Power Flash Device has you covered. What’s more, if issues arise, the SCT both reads and clears diagnostic trouble codes. The SCT has an easy-to-read color LCD screen. In fact, it is easy to scan through and make selections from the graphic interface. What’s more, the SCT tuner has built-in Wi-Fi for rapid-fire internet-based updates. On top of that, it boasts a customizable tune file with easy-to-adjust vehicle parameters. As such, you can use pre-loaded tunes or manage your own. In fact, there are already 10 custom tunes downloaded onto the device. The SCT is compatible with Ford F-Series Diesel trucks and excursions. Be sure to check with the manufacturer to ensure that your vehicle’s make, model, and year are compatible with the SCT. Not only does the SCT provide performance-boosting tunes, but it logs sensor data. With a little help from the SCT, you can easily stay on top of your vehicle’s maintenance needs while escaping the monotony of its stock vehicle settings. The SCT can be used on multiple vehicles. In fact, it has a total of five preset unlocks, enabling users to switch it in and out of vehicles as they choose. While this may not seem like a big deal, many tuners can only be used in one vehicle. On top of that, the SCT has two analog inputs. As such, users can pair it with other aftermarket accessories. TS diesel-specific Powerstroke tuning chip comes loaded up with custom tunes. In fact, the easy-to-install computer chip is preinstalled with six different custom tunes. Users can simply plug the chip into their vehicle’s computer system and then use the knob to control the settings. The TS even features a special anti-theft tuning position that is designed to deter thieves from hot-wiring a car. The TS Performance chip is compatible with diesel Ford 7.3 Powerstroke engines that date from 1994 to 2003. If you have one of these vehicles, you can easily install the TS tuning chip and use it to boost your vehicle’s overall performance. Whether you are looking for a good tow truck or daily drive, the TS will help take your vehicle from ordinary to over-the-top. After installing the TS tuner, most vehicle owners notice immediate improvements. For starters, the TS dramatically boosts a vehicle’s power. In fact, the TS even has a towing mode. It also improves a truck’s transmission shifts, dramatically prolonging its overall life. Just be sure to expect more noise and exhaust after you install it. After all, the TS will have your vehicle working a lot harder than it did under factory-installed constraints. Tuning kits enable drivers to dramatically boost their vehicles` performance without so much as lifting up its hood. While vehicles with 7.3 Powerstroke engines are like bucking broncos even with factory-set ECMs, there is still an abundance of under-the-hood power just waiting to be released. In fact, a solid tune can reformulate everything from a vehicle’s transmission shifts to its torque. Since most tuners offer customizable tunes, you can easily use these devices to fine-tune your vehicle so that it’s both comfortable and well-suited for your personal driving needs. Wondering how vehicle tuners work? Want to know what to look for in a tuner? Read along to learn more about these amazing automotive products and find out how they can benefit your Ford. Vehicle tuners can dramatically boost your vehicle’s on-road performance. In fact, they are designed to boost a vehicle’s horsepower and torque. As a matter of fact, many tuners can even increase vehicle’s fuel economy, adjusting the miles per gallon used by one or more gallons. What’s more, tuners can even alter a vehicle’s shift points and/or shift firmness. As if that isn’t enough, they can also modify a vehicle’s rev, clear trouble codes, and even recalibrate the speedometer. Most modern-day vehicles run off of computers. As such, it is increasingly easy to download custom programs and override a vehicle’s stock settings. In fact, vehicle tuners do just that. 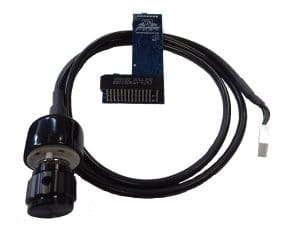 They connect directly to your vehicle’s onboard diagnostic port, where they download unique tunes, so that they are able to completely override a vehicle’s ECU. Most vehicle tuners can be installed in just a few minutes. In such a short time, they can conjure up a series of pivotal engine gains. At the same time, some tuners can also monitor engine data. What’s more, some can read and clear onboard trouble codes. Tuners may be souped-up digital devices or simple knobs. When choosing a tuner for your 7.3 Powerstroke, ensure that it is easy to adjust. While large colorful monitors appeal to many, these can add clutter to a vehicle’s dash. On the other hand, digital platforms typically feature detailed graphics and data readouts. Some tuners feature preset tunes that can be used to automatically alter engine parameters. Meanwhile, others enable users to tweak specific parameters to meet their personal driving needs. While preset tunes may sound generic, it is important to remember that they are a far cry from a vehicle’s factory-set ECU (electronic control unit). In fact, many tuners feature dynamic preestablished settings for towing, power, and efficiency. An engine tuner can increase a vehicle’s combustion rate, causing it to actually cut down its fuel consumption. It does this by altering the time at which the vehicle delivers fuel. An engine tuner can enable you to play around with your vehicle’s power settings. In fact, it may allow you to increase your vehicle’s intake in order to boost its horsepower and torque. A tuner can help you alter when and how firm your transmission gears shift. By altering your shifts, you can get a transmission gear to shift up or down depending on your vehicle’s RPMs. The shifting points affect the overall feel, performance, and longevity of your vehicle’s engine. When you modify a vehicle’s drive gears or tires, you automatically alter its odometer and speedometer. 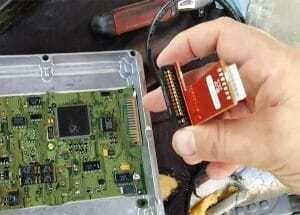 Fortunately, some tuners can recalibrate these mechanisms in order to fit your alterations. That’s because these mechanisms run of digital sensors that are controlled by a vehicle’s ECM. While small mods like this may not seem like a big deal, getting ticketed for unknowingly driving over the speed limit surely is. Some tuners are designed to interpret a vehicle’s sensor data. By interpreting trends in real time, a tuner can provide optimized tunes that are tailor-made for a specific vehicle. Many of them monitor a vehicle’s air/fuel ratio, EFT temperatures, and more. A vehicle’s OBD II automatically generates trouble codes when something is going wrong. Some tuners can be used to read and even clear these codes. While dealerships and mechanics typically charge a hefty fee for this service, a tuner lets you do it at home and for free. Pro Tip: A bad tune has the potential to wreak havoc on a vehicle’s engine. In fact, when a tune forces mechanical parts to work too hard, they may cease up or even break. With that said, replacing major engine parts can be incredibly costly. For this reason, it’s important to only purchase a reputable tuner from a respected retailer. It’s vital that the tune works well without overtaxing your vehicle. 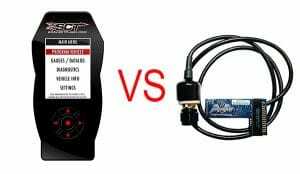 What’s more, the tuner should provide the option to switch back to a vehicle’s original ECU. Why Customize Your 7.3 Powerstroke? There are plenty of reasons you should consider tuning your 7.3 Powerstroke. For starters, reduced fuel costs could save your money. What’s more, a tune can make driving more comfortable and fun. If you’re someone who frequently tows or does a lot of highway driving, the ability to boost your power on the spot is priceless. On top of that, having a tuner that enables you to read and clear trouble codes is like having a best friend that doubles as a mechanic. After all, you’ll be able to finally ask your actual mechanic for exactly what you need to be done. If you’ve been looking for ways to get more power out of your 7.3 Powerstroke, a tuner may be the answer. After all, these clever devices enable you to alter your vehicle’s overall performance without having to commit to any real labor. Whether you are looking to improve your engine’s fuel economy or simply get more speed, the five aforementioned 7.3 Powerstroke offer nothing but steady improvements. While we’re confident in any 7.3 Powerstroke’s ability to succeed, a fine tune makes a world of difference.